Traveler diarrhea is presented with watery diarrhea. Traveler’s diarrhea occur due to ingestion of water and food which contaminated with gram negative rod E.coli. This is known as enterotoxigenic Escherichia coli. The strain f the E .coli is detected via the serotypes analysis of the H, O and K antigen. 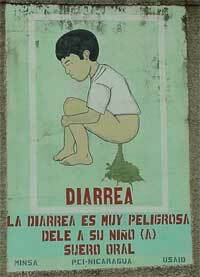 Properly cooked food and water may prevent the cases of traveler’ s diarrhea. Enterotoxigenic Escherichia coli ( lactose and sorbitol fermenter) may secrete two form of toxin. These toxins are known as heat stable enterotoxin and heat labile enterotoxin. Polymerase chain reaction is useful in detecting the present of these toxin genes. The enterotoxigenic Escherichia coli is the form of bacteria which does not invade but adhere to the epithelial cells of the intestine and release the toxin. There will be an elevation of the cGMP as a result of heat stable toxin which reacts with the host guanylate cyclase. Heat labile toxin/ A- B toxin will cause and elevation of the cAMP from the activation of the host adenylate cyclase. This occur from the ribosylation of the regulatory G protein by its ADP. Traveler’s diarrhea is a self limiting illness. The treatment is supportive and symptomatic in nature. The aim of the treatment include reducing the cases of dehydration by considering fluid and electrolytes replacement. 1.DuPont, Herbert L., and Charles D. Ericsson. "Prevention and treatment of traveler's diarrhea." New England Journal of Medicine 328.25 (1993): 1821-1827. 2.Shore, Eleanor G., et al. "Enterotoxin-producing Escherichia coli and diarrheal disease in adult travelers: a prospective study." Journal of infectious diseases129.5 (1974): 577-582.